India 2-50 (Virender Sehwag 19, Sachin Tendulkar 13*, James Pattinson 1-13) and 572 (MS Dhoni 224, Virat Kohli 107, Sachin Tendulkar 81, James Pattinson 5-96) beat Australia 380 (Michael Clarke 130, Moises Henriques 68, David Warner 59, Ravichandran Ashwin 7-103) and 241 (Moises Henriques 81*, Ed Cowan 32, Ashwin 5-95) by eight wickets. Australia scored 380 runs in their first innings followed by 241 in the second. India piled up 572 runs in the first innings and achieved a nominal target of 50 runs after losing two wickets. 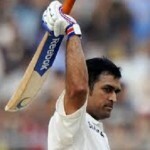 MS Dhoni, the Indian captain, was declared ‘Player of the match’ for his match winning knock of 224 runs. The first Test of the four match series concluded in the first session of the fifth day on Tuesday, February 26, 2013, at MA Chidambaram Stadium, Chepauk, Chennai. Earlier, the Kangaroos went into bat at 9-232 in 84 overs whereas Moises Henriques was batting at 75 on his debut and Nathan Lyon was supporting him for 8 runs. Henriques played the first over of Ravindra Jadeja as a maiden and Lyon repeated it in the next over off Ravichandra Ashwin. They collected four runs in the next two overs and the following two overs ended as a maiden again. The batsmen were demonstrating a subdued innings against the quality spin bowling of the hosts and they were unable to get any boundary. Nathan Lyon did not survive longer and was smartly caught by Murali Vijay at short leg off Jadeja for 11 on the last ball of the 93rd over. Moises Henriques stood firm at his end for 81 off 148 deliveries with 2 grand sixes and 6 fours as the entire Australian side was bowled out for 241 in 93 overs. 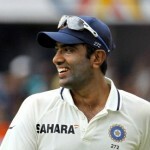 Ravichandran Ashwin was the highest wicket taker with a tally of five, Ravindra Jadeja held three whereas Harbhajan Singh claimed two wickets. India required 50 runs to win the encounter and the innings was opened by Murali Vijay along with the master blaster, Virender Sehwag. 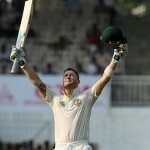 James Pattinson did not give any run in his first over as Vijay lifted Nathan Lyon for a six in the second over. Sehwag hit the first four of his innings in the next over as Vijay was caught by Henriques at mid-off at the bowling of Pattinson for 6 on the last ball of the third over. Cheteshwar Pujara joined in next with Sehwag who added 8 runs in the fifth over with a four and got another boundary in the seventh over. Virender Sehwag became the next victim when he was caught in the slip by Michael Clarke off Nathan Lyon for 19 on the second ball of the 10th over. The little master, Sachin Tendulkar walked in next and dispatched two back to back sixes on the next two balls. The home side attained the target in the 12th over by scoring 50 runs, Tendulkar and Pujara were unbeaten for 13 and 8 runs respectively. 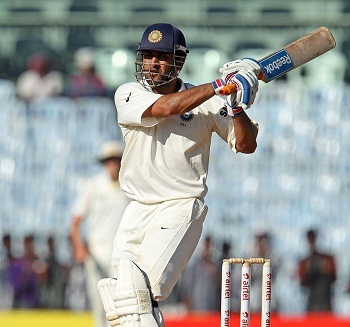 India triumphed in the opening Test with a huge margin of eight wickets and leads the four match series 1-0. The second Test of the series will commence from March 2, 2013, at Rajiv Gandhi International Stadium, Uppal, Hyderabad.